In the ever-changing world of Little Caesars and Dominos, it’s hard to enjoy an individual slice or two of pizza. Whatever happened to the good old days when we can head down to a local pizza parlor and purchase one individual greasy slice of meat lovers pizza with your left over allowance. Sometimes, we are not in the mood for a discounted large pie combo with a side of wings only with the purchase of one small pizza. It’s only human to want to break free from the world of bundles and combos every once in a while. Garage Pizza, a part-time pizza parlor and part-time memory bank, brings that humanity back into Silverlake. 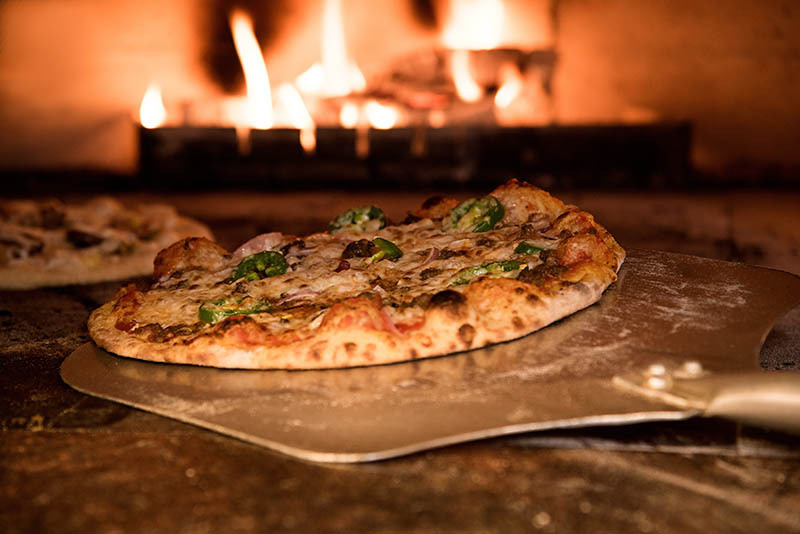 Located in a shopping center on Sunset Boulevard and Fountain Ave, this industrial style pizza shop brings back all your childhood memories of pizza by the slice while bringing in a grungy modern twist. Along the walls are painted works of rock icons such as Debbie Harry and Pete Townshend holding Garage’s popular pizza slices. Apparently, Jim Morrison is a fan of pepperoni, olives, and mushrooms and “The Tide is High” singer is a simple pepperoni gal. The architectural transparency of Garage Pizza from it’s display case to its bustling deck oven constantly waving to its audience sends a clear message to it’s guests; a good slice of pizza can go a long way. 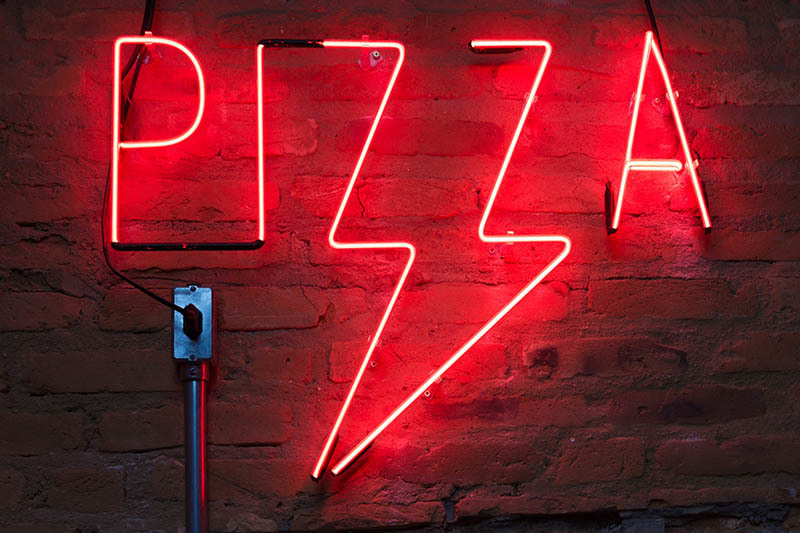 The trendy hot pie joint has an extensive menu and still manages to maintain it’s classic “good pizza, good vibes” aura. Essentially, any pizza slice can be created from your imagination since a “build your own” option is available starting at $3.50 for a slice of cheese and $0.75 each additional topping. Toppings range from meats such as pepperoni, ground beef, and ham all the way to cheeses and veggies like pepperoncinis, feta cheese, onion, pineapple and basil. The opportunities are endless! Aside from building your own slice, their menu is also home to a plethora of unique staples you can purchase by the slice or as a full pie. One being their self-titled, “Garage Pizza” that includes ground beef, tomato, red onions, and pickles. Another popular pie is the “White” which includes ricotta cheese, no sauce, mozzarella, sauteed garlic, and basil. Pizza is not the only thing on the menu here since Garage Pizza also serves delicious sandwiches, salads, chicken wings, and even calzones. Yes, calzones. Their steaming hot pockets of love come with ricotta, mozzarella, and your choice of three toppings. Is your mouth watering yet? Mind you, there are vegan options available as well such as their pizzas with vegan cheese and their mixed green salads. Whether you want a pressure free dinner date or a quick lunch while strolling through Silverlake, Garage Pizza is the place to be. Also, they close shop at 4am, so do not rule out a hot slice…or 4 after the bar closes; just make sure to get a ride safely. Those good old days of buying pizza by the slice with leftover allowance you reminisce on are brought to life at Garage Pizza.